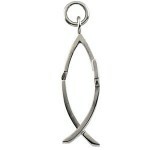 The CrossFish pendant is a very beautiful and interesting religious pendant. A patented 3-D design buy Eyevolver Designs, the CrossFish pendant is a cross when viewed from the front and a fish when viewed from the side. Available in 14K yellow gold, 14K white gold, and sterling silver and in two different sizes. 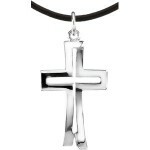 The sterling silver pendant, when purchased from ChainzOnline, includes a black leather cord and a blue suede gift pouch. 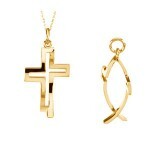 The image to the left depicts the silver Crossfish pendant when seen from the front. Thanks for finding our design and giving it some recognition. We are very humbled by the response of folks to the variety of products now being produced. My customers frequently tell me how often the CrossFish is noticed and commented on when they wear it. Actually, I’ve added a bail with a swivel for a couple of clients so that the pendant rotates freely.